Kimud Shoal is a great circular in hard and soft corals covered shoal known for its many hammerhead sharks. Kimud Shoal is a fairly small shoal. Almost circular, it is possible to swim all the way around the edge in one dive. The top of the island lies at 12-16m, and the steep sides drop off to 200m+. 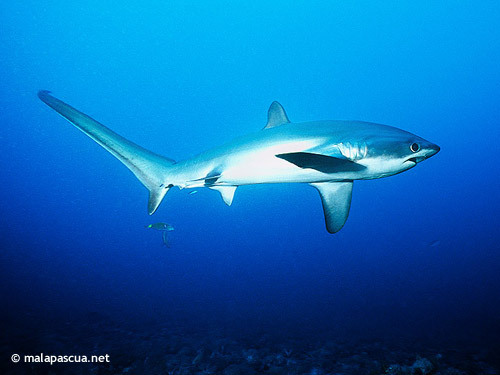 It is near to Monad Shoal so we often see thresher sharks, mantas and devil rays. Turtles are occasional visitors. The top of the island has a lot of hard coral, and many excellent hiding spots for moray eels. The sides are covered in soft coral growth. Many species of shrimp can be found among the corals and several species of unusual nudibranchs. The east side is especially interesting for its rock formations and overhangs. Because of the drop off, at any point on the island there is the chance of seeing pelagics such as sharks, rays and tuna. Recently spotted here - a school of 50 hammerheads.